I’ll be launching and signing my novel and first in the Far-called series, In Dark Service, at the Forbidden Planet London Megastore on Thursday 15th May from 6pm – 7pm. 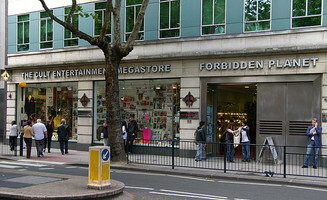 Your teleport co-ordinates are Forbidden Planet London Megastore, 179 Shaftesbury Avenue, London, WC2H 8JR, UK. The first novel of a new fantasy series, In Dark Service takes my work in a brand new direction. The novel follows the Carnehans and Landors: two families whose children are kidnapped by slavers from the town of Northhaven in the Kingdom of Weyland. The town launches a rescue expedition to free the taken from captivity, but with little chances of success. Featuring heart-breaking characters and breath-taking world building, the novel focuses on both the adventures of the pursuing townspeople and the slaves’ struggle to survive their harsh captivity. « Win a chance to fly on a real airship (a rather big one).